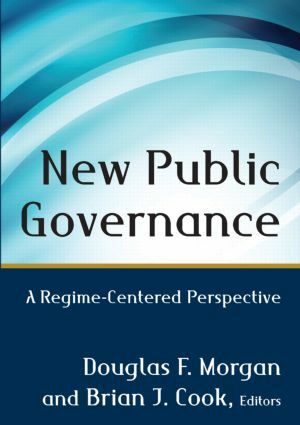 Written by scholars who have been at the forefront of the NPG debate as well as by scholar-practitioners, this book provides lessons learned from experience on how networked, contract-based and partnership-centered approaches to government can be undertaken in ways that preserve the values at the center of the American constitutional and political system. Part I. Developing a Theory of Governance for NPG: What Should Be at Its Center? Douglas Morgan is Professor Emeritus of Public Administration and Director of the Executive MPA Program in the Hatfield School of Government at Portland State University, USA. He has held a variety of public positions, both elected and appointed. His research interests focus on the role career public administrators play in ensuring effective and responsive systems of local democratic governance. He is coauthor of Foundations of Public Service (2013) Budgeting for Local Governments and Communities (2014). His work has appeared in the Handbook of Administrative Ethics, Oregon Politics and Government, The International Encyclopedia of Public Policy and Administration, Public Administration Review, Administration & Society, and Administrative Theory & Practice. Brian J. Cook is Professor and Chair of the Center for Public Administration and Policy (CPAP) at Virginia Tech, USA. His teaching and scholarly interests center on public administration and constitutionalism, public administration and American political development, and the politics of public policy design and implementation, especially in the area of environmental policy. His most recent book is Democracy and Administration: Woodrow Wilson’s Ideas and the Challenges of Public Management (2007). He has served as a policy analyst, advisor, research consultant to several federal, state, and local government agencies. He is currently completing a revised edition of his 1996 book Bureaucracy and Self-Government.